There is a lot that goes into building a website. It starts from design and then goes to development. It may seem easy at first, but it is not. This is why premium WordPress themes are so popular, no matter the niche they provide an easy way to get a stunning website without previous knowledge required. If you are serious about showcasing your videography and standing out from your competition, then the following collection of video WordPress themes will help you get started. They all share the common feature of video support, and from there each comes with its own way of beautifully enhancing the content. Take a look at the top best WordPress video themes. 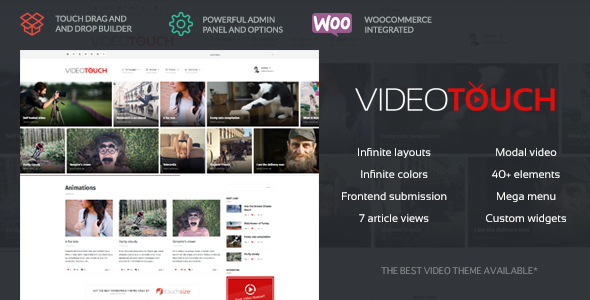 VideoMag is a gorgeous, stunning, pliable, and responsive WordPress video theme. VideoMag is a beautifully developed theme that has been designed for video magazine, video blog, video tube or video portal. VideoMag is packed with amazing customizations, while also supporting major video platforms such as Vimeo, YouTube, and Twitch, making it attractive for website creators and users alike. This theme is very engaging and it focuses on your content and takes it to a whole new level. Be bold with VideoMag. 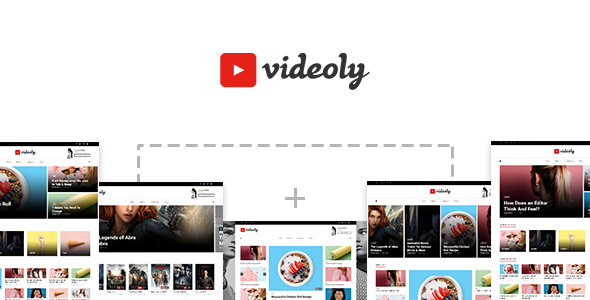 Videoly is an elegant, intuitive, all-in-one, responsive video WordPress theme. Videoly was designed with versatility in mind and to exceed one’s expectations. With 9 complete designed and pre-made homepages, and Visual Composer, you are free to create any page layout you like to showcase your content. You can also personalize the theme to give it your creative touch by using the integrated powerful admin panel. Vysual is an award-winning WordPress video theme designed specifically for film campaigns and movie marketing, but works great for video sites as well. This theme utilizes built-in features of WordPress, making it really easy to use and setup. It comes with YouTube, Vimeo and self-hosted MP4 video support, video background, AJAX loading, and poster credits in the footer area. The Producer is a premium theme with an enthralling, stylish and modern design. The Producer is simply put, a beautiful theme developed by passionate graphic designers and seasoned web developers, and this shows throughout the theme. From start to finish, The Producer is easy to set up and customize. You can install the demo content, and then personalize the theme through the WordPress Theme Customizer. This theme is well maintained, improved and updated constantly, by its power elite author. It’s easy to tell that this theme was designed and developed to display videos stunningly. 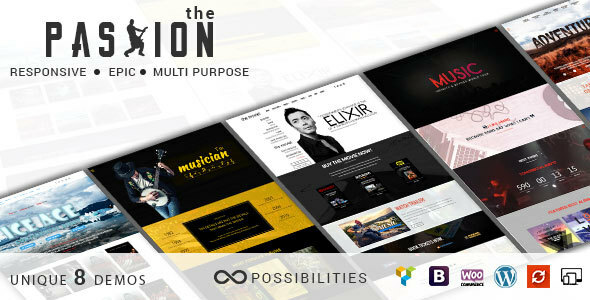 The Passion is a crisp, fresh, and minimalist highly customizable WordPress multipurpose video theme. If you’re in the entertainment business then The Passion is the theme for you. The Passion was crafter to provide an easy and intuitive platform for video content creators to display their videos without having previous knowledge of WordPress or development. This theme includes a vast selection of features such as: various pre-built demos, 5 unique listing styles, SEO friendly structure, 5 carousel styles, custom widgets, and many more. Vlog is a gorgeous, professional, aesthetically stunning, and highly responsive WordPress video theme. Vlog has been designed and developed by a dedicated team with vlogging and videography in mind. The theme supports YouTube video, Vimeo, Dailymotion, and many more. Vlog includes an awesome video importer plugin for importing video from any platforms to your website. In addition to this, Vlog comes with the plugin Series, which you can use to group your videos and articles into playlists; this is extremely useful for adding multi-part content. 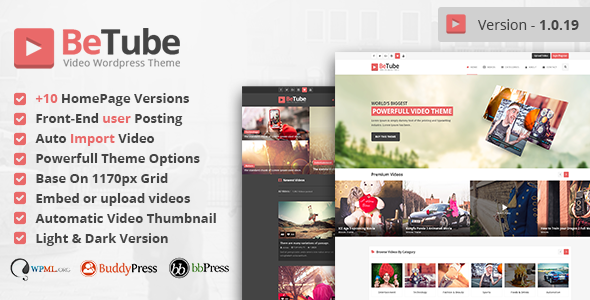 Betube is a colorful, aesthetically pleasing, easy to use, and dynamic theme. Betube is bold and intuitive and it is an amazing platform for displaying video content of any kind. Betube has been enhanced with more than 10 custom developed pre-built homepage demos that will help you establish an online presence in a jiffy. Betube is very easy to use and you need no coding experience to be able to customize it to your liking. 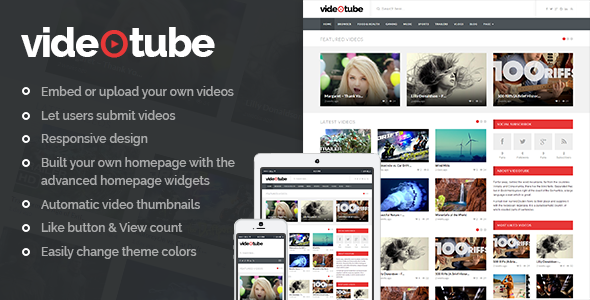 Try Betube today - it's one of the best video WordPress themes. Soledad is a unique and highly customizable premium theme that includes 2000 demo homepages you can choose from, among which is SoledadVideo. With over 800 sliders and blog magazine combinations and 400 customizing options, we have to give it to them – this is a truly flexible theme. Soledad works perfectly with Visual Composer, WooCommerce, PolyLang, and WPML. In addition to all of this, it is integrated with the Penci plugins. This theme is the perfect on for video content. VideoPro is the ideal theme for those who wish to create a beautiful website. VideoPro is extremely flexible and fluid, and it will fit perfectly to any type of content, especially video. In terms of customizations, with VideoPro you will be able to allow visitors to submit posts, build a movie database with multi-episode series, setup channels of videos, watch video without opening new page, and many more video related features. If you are considering expanding your online presence and want your videography to reach more people, then TrueMag is the theme for you. TrueMag will enhance your content and display it more practically and aesthetically pleasing in order to keep your visitors engaged. TrueMag is fully responsive and your content will look beautiful on all screen sizes and mobile devices. I recommend checking out the live preview of the theme to see what more it can do. This is a great way to test the theme and see if it fits your needs. 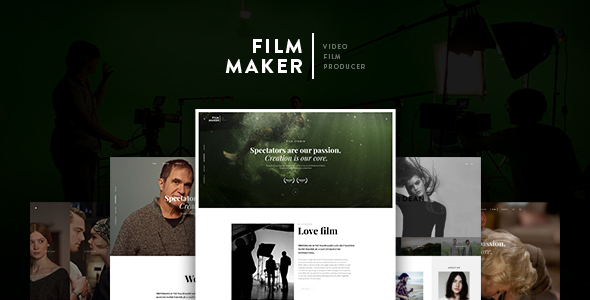 FilmMaker is a remarkable, stunning, smooth, and modern premium theme ideal for video bloggers, videographers, and more. With FilmMaker it is guaranteed that your website will clearly and decisively differentiate itself from the competition. FilmMaker is Envato’s best-selling video theme because of its amazing design and highly tailored niche related features. This theme comes bundled with major premium plugins such as visual composer, revolution slider, and master slider. In the theme’s package you also get a child-theme so you can furthermore customize the theme if you find that its built-in features are not enough. VideoTouch is truly outstanding intuitive video WordPress responsive theme. It was developed with the intention of creating an incredible easy to use theme perfect for beginners and advances user alike, this is why this theme is packed with features while also being intuitive. With absolutely no coding experience, you can create beautiful page layouts to show the best of your videos. The choices for layouts and colors are infinite and you can personalize your website with just a few clicks. The theme also includes a drag and drop page builder, 40+ customizable elements, mega menu, custom widgets, and WooCommerce integration. 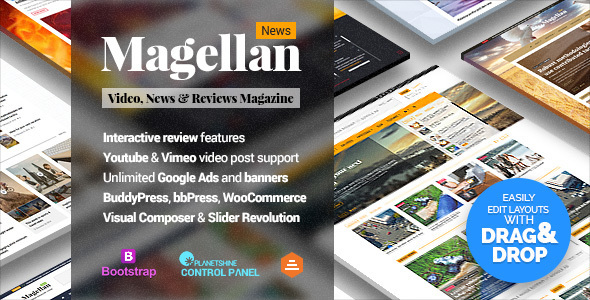 Magellan is a clean and charming news theme that will take your content to the next level. Developed by an elite author, and with an almost perfect rating, Magellan is a great platform to showcase your videos. The theme is completely responsive and compatible with high-definition retina displays. Many are intimidated by the idea of having a website, but with Magellan everything is easy from the installation, to the demo import and the customizations. In addition to this, this theme uses drag and drop technology, making it extremely easy to change the layouts to your taste. Snaptube is a premium WordPress template mostly orientated towards video creators. It comes with a fresh and clean design that focuses on the content. It is fully responsive and cross-browser compatible so your audience can reach you regardless of the device or browser used. Snaptube makes everything simple and lets you add your personal touch through the theme customizer and the powerful plugin Visual Composer. The theme includes an extensive and useful documentation, as well as eager to help support team. 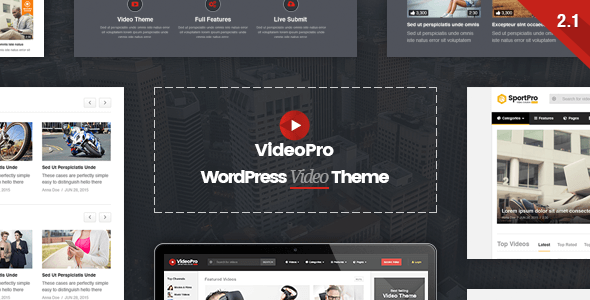 VideoTube is a resourceful video responsive premium WordPress template. VideoTube is flexible and intuitive and it will adapt easily to any needs. It includes 10+ pre-built hompage templates to play with and personalize. Customization the theme requires just a few clicks, and the theme comes fully documented in case you get any help. VideoTube has plentiful features such as: responsive design, easily embed videos from Youtube, Vimeo, Dailymotion, Hulu, automatic video thumbnails, various widgets packed with options, and a channel page. VideoTube is what you have been looking for! 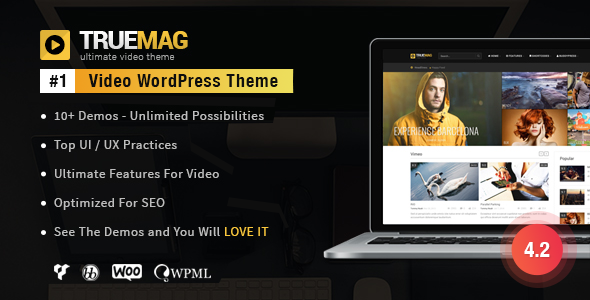 With more than 40.000 downloads, it’s safe to say this is one of the best and most popular and versatile WordPress themes. 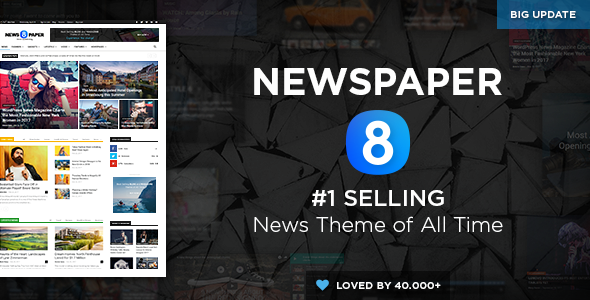 With Newspaper you can showcase any type of content, from travel and music, to food and lifestyle. It has an elegant design, is incredibly flexible, translations are integrated, and is very easy to use and set up. The demo content comes with it - so you don’t start from scratch, it is also packed with a page builder, and loads incredibly fast. And trust me, when your website is full of content, this is important. Primero is definitely not among the most popular premium video WordPress themes out there, but it is surprisingly pliable, powerful, and intuitive. Primero is incredibly sturdy and will handle any type of content you through at it. Primero supports both video and photography content, it is incredibly easy to customize via the theme’s extensive options panel, has unlimited background color options, offers 3 unique featured sliders to choose from, and 4 navigation styles. Furthermore, for beginners, it comes with a complete video documentation. 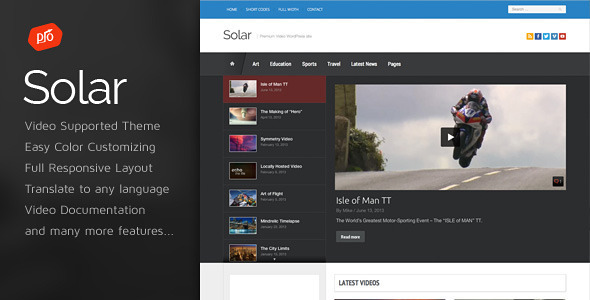 Solar is an incredibly sophisticated, easy-to-customize and fully featured WordPress responsive theme. It is filled with design elements that will improve your website and make it vibrant and easy to navigate. Solar is uniquely designed and will surely captivate your visitors’ attention through its beauty and your content. Video support is included throughout the theme, including the slider. Your videos will adapt beautifully to any device or screen size because Solar is fully responsive and retina ready. Aware is a truly stunning, sophisticated, modern, and responsive WordPress portfolio theme. This theme has the remarkable capability to showcase any content or portfolio beautifully without over bearing the user with unnecessary information. Aware includes an Ajax homepage portfolio that responds perfectly any screen size and device used. It also comes with an advanced theme options panel, 1-click shortcodes, 5 custom widgets, and a top panel drawer. Aware is an awesome theme that you need to try! 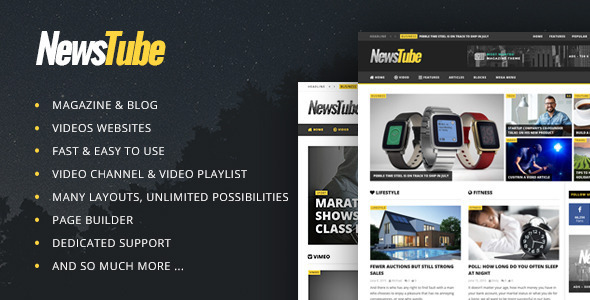 As the name suggests, NewsTube was designed mainly for magazine-type websites, as well as blogs and video portals. The theme comes with flexible layouts and extensive theme options, which allows you to easily customize your website exactly the way you like. It supports videos from popular sites including YouTube, Vimeo, and Daily Motion. You can also submit videos from front-end, create great video channels and playlists, or import YouTube videos and channels to your website. Not too shabby. Themeisle developers gave their best to design a visually stunning and elegant WordPress video responsive theme. TheMotion has been built exclusively for video content and creative users to help them reach a larger audience. The included one click demo installer will allow you have a full website in under a minute. The theme is SEO optimized and developed under the latest standards of coding. Through the live customizer you will find tons of styles, customizations, and effects at the ready for you. Viduze is a WordPress video multipurpose magazine theme with a small inclination for videos and professionalism. Viduze comes with the demo content to give you a head start between a fashionable and useful design. This theme unlimited color settings helpful for creating a personalized theme skin. You also get hundreds of Google fonts options for the best look. Viduze provides numerous blog layouts to display and full compatibility with WooCommerce. It has also been SEO optimized and it is fully responsive. NewsMag is a great video WordPress theme with a professional and clean design ideal for magazines, news portals, and personal blogs. All of its design elements are customizable so you can create something special. It is fully responsive and retina ready, as well as SEO optimized, and the demo content is included. Using NewsMag, your video content will have a higher chance of reaching wider audiences. 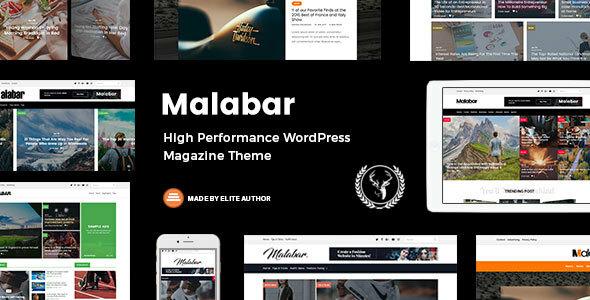 Malabar is an extremely accommodating and eye-catching premium WordPress theme. Developed and designed for various uses and not a specific niche, Malabar is very flexible. You do not need to have a web development background to be able to use this theme, nor do you have to be creative to design a beautiful website. For beginners, the theme installation is beyond easy and only takes a couple of minutes. Apart from that, the theme comes with 15 pre-built demos you can use through the one-click installer. Further customizations are possible through the live customizer. Go ahead and choose one of the video WordPress themes presented above to give you a head start in creating an engaging and visually stunning website. If you believe we missed a theme that would be a great addition to this list, let us know!